And ALL truly means all, K-12 and higher ed. As with most binding plans designed to govern and transform the “entire educational experience” of the 21st century, the blueprints were sitting somewhere no one was likely to look. Especially since it is a higher ed document by one of its governing groups.http://www.aacu.org/leap/documents/GlobalCentury_final.pdf It just happens to mention that theses are Outcomes and then Principles of Excellence that apply to students in K-12 schools as well. The accreditors then know all this and will enforce this vision out of your sight. The central office staff will know it. I have no doubt that this is what is behind that new EdLeader 21 Coalition of Suburban Districts as their Supers take those districts where the urban districts have already gone. When you add what is in that AACU link to the AACSU initiatives we went over in the last post. Plus this AACSU Seven Revolutions Vision for Educating Globally Competent Citizens and we truly do have a noetic revolution going on in our midst. http://aascu7revolutions.pbworks.com/w/page/39316693/FrontPage?mode=embedded gives you something to ponder on the Mindsets being created in these current and future voters, especially with governance in the future listed as one of the 7 Revolutions. Like all things that might be controversial if known accurately in education and public policy, the rhetoric of this has now been toned down to Global Engagement. But the 7 Rev Framework remains and as I am about to explain, also applies to what is expected from high school graduates. It’s no accident that the 7 Rev developer institutions have large teacher colleges. Some of them, like Kennesaw State, have huge programs, especially for continuing education. And that is certainly a stealthy way to get a revolution to invisibly trickle down. Influential but mostly out of sight. The preferred 21st century transformational method as we now know. So polar bears may not actually be endangered and we have had 17 years without increases in global temps but schoolchildren are not to know that. Influential false beliefs change behaviors, prompt action, and make future citizens willing to tolerate Invasive Governments at every level. Then NG nicely gives a link to UNEP so teachers can download those materials as well for the K-12 classroom. http://www.unep.org/tools/default.asp?ct=clim is that link. Remember factual reality affects actual consequences, but personal perceptions of reality guide an individual’s future behavior. And now education is deliberately splitting factual reality from perceptions. Without notice. The document by the way is from 2007. So while what will become known as CCSSI was being planned but before it was official, a governing document of the defining implementation principles once again was published. Where few but silly Miss Marple with her determination to track down the relevant blueprints would ever look. Think of those Essential Learning Outcomes as laying out future Personality Characteristics for All Students. Best described, in my opinion, as specifying Who each Student Will Be Inside, Be Able to Do, and Be Ready to Act on, and What they Will Believe. As the report says “beginning in school.” No wonder preschool too has now been targeted for transformation and monitoring for social and emotional learning. After all it takes time to ensure that “all students” have “an informed concern for the larger good.” To be guided in life by always asking “what is most worth doing?” Nothing personal to my teacher readers, but an ed degree, or a political science doctorate, or urban planning masters do not qualify anyone to create a curriculum designed to mandate that attitude. And I would be the first to concede, neither does a law degree. That should be an individual decision backed up by the wisdom of the ages. And no I am not referring to the Dalai Llama’s version of the wisdom of the ages. Which is part of the reason contemplative education is so troubling. That takes the personal decision away by grounding action in unconscious feelings and school redesigned new values. But the contemplative push meshes with this new Essential Learning Outcomes perfectly. Now doesn’t that goal mirror the reasons laid out in the last post for using education to mobilize low income children of color? You can organize students and parents but this vision cannot make the world work the way it plans. It simply removes the mental tools that can best help the individual cope with genuine daily problems. I need to move on but Martha calls this sought view for ed “cosmopolitan education” and it is clearly why she was the IB’s Keynote Speaker on creating desired Worldviews. I am going to quote in its entirety the AACU’s Principles of Excellence framework since it is THE governing vision for what students are to become in the 21st century, using K-12 and higher ed, and CCSSI and Democracy Projects and Global Competency etc as the cudgels to make it so. And personal data to monitor it is happening. I bolded that Shared Purpose to be able to point out that is describing the Community of Learners concept we have traced back to Michael Cole, Courtney Cazden, and Ann Brown’s visit to the Soviet Union during the Cold War. Please also notice what the continuous improvement is in. These listed Learning Outcomes. We will be here all day if I describe all the ways these Outcomes reflect every post I have ever written on this blog. No wonder I found what I found and we can talk about the links in comments if you like. I just want to close by pointing out that I do track these ed reforms all over the world. I download and read those reports and frameworks too even though I do not usually mention in posts. I think committing a deliberate murder of American exceptionalism and our superpower status and the primacy of the US Constitution are all express goals of the implementation of these ed reforms. And others I know about. But when the transformation of the US is done, the goals of these Principles of Excellence align with what I have seen in every country I have ever reviewed ed reforms in. Global indeed. But as the criticisms of Martha Nussbaum’s cosmopolitan education have pointed out, this is citizenship for a world that has never existed. Which may not slow down all those being paid to push this vision. But it truly ought to be a compelling concern for those of us providing the funding for this takedown of the US. Because the desired social, political, and economic Transformation is always the actual Goal behind all these ed reforms that become notorious, or will when fully implemented, I have joked that the only real question for a Principal, Super, Prof, or Accreditor mandating them is “Are you an Intentional Insurrectionist or an Inadvertent One?” In other words, are you on board with the attempts at a Mental Revolution of the Western Mind to devolve back to the Visual and Emotional and Instinct and away from the Abstract and Reason and Genuine Intellectual Analysis based on Actual Individual Knowledge? And if that seems to be an unduly strong statement, please read some of the earlier posts. Especially why Paul Ehrlich wants Newmindedness and James Burke wants education to reject the Axemaker Mind. Texas is a fascinating special case because what was going on there became the subject of discussion in the 2000 Presidential Race and a Model for NCLB. And now it is an issue because Texas, one of the largest states and an important driver of textbook content, has very loudly and deliberately rejected participation in either Race to the Top or CCSSI. Wanting to be able to drive its own ed policy and its own content. Last month I explained that both President Obama and Ed Week were using the term “common core” to describe not the CCSSI content standards but the “Standards of Teaching and Learning.” http://www.invisibleserfscollar.com/didnt-the-president-just-admit-ccssi-was-a-ruse-to-change-classroom-interactions/ Texans need to read that description because the school and classroom practices and activities I am seeing at Annual Meetings and professional development sessions and conferences around preparing for the new STAAR assessment and the new Readiness Standards look just like what I would see in any state with a Learner-Centered Classroom, not a Content/Instruction Centered One. Texas is thus proof you can get to what I call the Transformational Outcomes Based Education Stage without the political establishment at the State level ever Knowing what has happened. Part of the ease of deception is the Orwellian use of Language and Unappreciated Definitions in Ed World, notably Rigorous when STAAR was adopted. http://www.invisibleserfscollar.com/what-if-higher-order-thinkingdeliberate-confusion/ The fact that the Legislature was now gearing a measuring assessment to John Dewey’s Indeterminate Situation where students react from emotion because there is no fixed solution and the problem-solving is not linear or based on the resolution of taught material was apparently left out of those presentations in Austin. I wonder if the presenters were some of the same people involved with pushing Saul Alinsky’s community organizing in the Austin schools or now adopting SEL (Social and Emotional Learning) for Austin preschoolers and elementary school students as part of a national program as we described in the last post? Be very careful who you get advice from in this area. That’s always good advice but especially so in Texas where as the title says, we have Intentional Insurrectionists determined to implement Equity Education and Education (in their determination) fit for a democracy (little d just like Dewey) in the 21st Century. The May 2008 document “Creating a New Vision for Public Education in Texas” was based on meetings that started back in September 2006. Before I get into the specifics of those radical intentions of listed Supers (who actually regard themselves as acting as Modern Day Founding Fathers rejecting the Articles of Confederation as insufficient for their intentions), how many Texans know that Texas went to Outcomes-Based Education back in 1984? That would make Texas an early adopter. According to a 2001 Dana Center report Texas deliberately jettisoned what it called the “deficit model” of knowledge transmission that was impacted by where students lived and who their parents were to measuring what all students are able to do. And using something termed Proactive Redundancy–multiple ways to achieve specific learning goals. My purpose is not to give a history of Texas education. It is to point out that the Achievement for All Students Transformation in Texas was done at the cost of changing the rules and the purpose of K-12 education. And constantly changing the measurements of what was going on in the classroom to obscure the effects of ever decreasing knowledge that is the inevitable and sought result of the OBE focus. The newest so-called test, the STAAR assessment, is based on Norman Webb’s Depth of Knowledge (DOK) Chart that is also used in Florida. It is what the Critical Thinking push is actually all about there as well. No I am not going to state the obvious connection. You can in your own mind but leave me out of it. Too many well-connected people involved who seem to genuinely believe they are doing Good Things in Education. But the facts are what they are and Webb’s DOK is expressly based on Ralph Tyler’s Objectives work and Benjamin Bloom’s Taxonomy (Mastery Learning, OBE’s previous name) work. http://www.invisibleserfscollar.com/if-standardsoutcomesobjectives-what-is-the-real-common-core/ Sometimes the true connections exceed anything a writer of fiction would ever come up with. So Level 4, Extended Thinking in the DOK, gets met if the student if the student does not know anything but is engaged in a nonroutine investigation with multiple solutions that the student examines and then processes the possibilities over an extended period of time. Dewey loved his Indeterminate Situation Theory because he believed the resulting emotion of frustration would be a great motivator in students to reject the world as it currently exists. Linear, factual, traditional solutions apparently are insufficient motivators to be a Social Change Agent. Instead, the Indeterminate Situation was thought to motivate Transformative Social and Political Change. In the 21st century then we can anticipate lots of Critical Thinking around Sustainability Modelling and overpopulation. The actual facts and temps be damned. After all factual knowledge is only Level 1 on the DOK and thus totally unsatisfactory. I guess all that Systems Computer Modelling around the discredited 1976 Club of Rome report Limits to Growth also qualifies now in Texas as Level 4 Thinking in the classroom. Systems Thinking also fits with the language of that Super Insurrectionist Vision. Someone had clearly read their Bela Banathy and Peter Senge. By the way, since Outcomes and Objectives became notorious terms in the past as synonyms for the whole behavioral and affective orientation (values, attitudes, beliefs, and feelings) of these student goals and performance is the term the CCSSI assessments are using, I see the creative minds in Texas have come up with another euphemism–Expectations. Student Expectations. What the student can do with the Content listed. Which reminded me quite frankly of a CCSSI document I had seen less than 2 weeks ago. Put out to make sure that supers and principals and teachers in the CCSSI adopting states were not teaching the content and emphasizing knowledge as the point of CCSSI. That the point of content learning is the worthy task performances and problem solving activities and projects that students engage in. The authors Jay McTighe and Grant Wiggins want to make sure everyone understands that that the Common Core rejects this previous “content” coverage mentality. Now I got someone very angry at me recently when I called CCSSI a Bait and Switch since no aspect of the real implementation does anything but dispute the fact that it is about national criteria of content knowledge applicable from state to state. But then I have analyzed all the relevant documents too carefully to have any room left for wishful thinking. I think what is happening in Texas reenforces the point I have made earlier that this really is about using the schools to mount a stealth political coup. The way Banathy described his purposes for the Learner Centered Classroom is consistent with how the Best Practices book describes the purposes for Standards for Teaching and Learning and what the Hewlett Foundation describes as the purpose for Deep Learning (which is deemed to align with CCSSI). They are all also consistent with that Texas Super 2008 Visioning document that will have to wait until the next post for its own description. Recognizing the points being made in the descriptions of Texas Student Expectations for STAAR and the Readiness Standards now in effect and the troublesome implications of official references to P-16, I decided to see if McTighe and Wiggins and their Understanding by Design had any role in Texas transitioning to STAAR. Oh. My. Goodness. They are every where there in the last year. So whatever the intentions of Texans and their politicians, what is coming to your schools and classrooms reflects what the rest of the country is being forced into under the CCSSI mantle. Isn’t that interesting? You would think the actual impetus really was national and international. To be Equitable of course in a tragic and perverse way that insists no one gets to have an Axemaker Mind. Because not everyone is equally good at abstract, logical, sequential ways of thinking. We somehow forget that the Whiz Kid may also be uncoordinated in sports or cannot put together Basic Legos even with detailed instructions. I will come back to Peter Senge and Systems Thinking in a later post. He represents both the how–Forcing Systems Thinking and the related New 3 R’s-Relationships, Rigor, and Relevance in their new meanings forms on what had been high-achieving schools in suburban districts and students in high-achieving courses of study anywhere. Senge also gives useful insights into the real Where–the reimagined Sustainable Future that he calls the Regenerative Society. Hint: it’s to be built around Relationships with one another and not seeing human beings as a special species. There’s also a great deal of emotional connections so all this SEL emphasis and Dewey’s Quality Learning will be so handy. And after all widespread prosperity was so 20th Century. This Regenerative Society will be so cooperative they need the schools to mandate creating the requisite mindsets. Some cooperation, huh? Today we are going to focus on the Why. At least some of it. I hope this post will be as much of a shock to each of you reading as it was for me to come across this several times in research. And then to bore in carefully to be sure. For a country where millions of voters in 2008 chose to show they were ready to move to a post-racial America it is painful to discover that the education establishment is not ready to move on at all. Too politically useful and financially rewarding for a directing, planning elite is probably the best way to describe this. As you will see nothing except equal outcomes and no more racial or economic segregation by neighborhoods will suffice to stop the manipulation of students and schools. And at that point the governments at all levels will be so intrusive. And the future voters will know so little and will have been so manipulated in preparation for the redesigned Sustainable Regenerative Society. It is hard to envision anyone surviving with independence and an individual presence of mind. Why? How many of you remember the confrontations over busing? The long-sought remedy was metro-wide busing to force integrated schools even where the inner cities were separate school systems. When the Supreme Court said no in 1973 in the Detroit case it did leave an opening if officials could prove intentional discrimination by suburban officials impacting the inner city. Many Southern school districts like Charlotte or Montgomery County or Nashville or those in Florida were usually county-wide school districts. But not Atlanta. Atlanta city schools (APS) (home of the infamous cheating scandal) itself is in the middle of the Fulton County School District. The one we talked about in the last post and the one with what I call the duplicitous charter, enshrining the tenets of Transformational Outcomes Based Education. http://www.invisibleserfscollar.com/what-happens-when-a-charter-pillages-minds-and-wallets/ Interestingly enough, that charter also adopts the essential policies and practices used by APS. What are the odds? The metro Atlanta school desegregation case (Armour v Nix) seeking metro-wide busing was rejected by the federal district court in 1979 despite evidence of official action behind patterns of segregated housing in the metro area. Other school systems that previously bused students have sought court declarations that they are now “unitary” systems and entitled to leave court supervision and return to neighborhood schools. If these become segregated again, there is no judicial remedy. That has happened in places like Charlotte and Montgomery County, Maryland. The response from the education establishment though is not to make all schools better. Instead the response is the SEL, PBIS, Positive School Climate, Career Pathways for all vocational approach, learner-centered change the student focus we have been describing all summer. There is tremendous anger over this issue that appears to be actively cultivated in Colleges of Education. Basically the cultivated demand is if economic and social justice is not the norm for all students in the US, no student in a publically-funded school should have access to an academically excellent education. The levelling function of government coercion and the power of the accreditors kicks in to try to deprive any American student of an Axemaker Mind. But we taxpayers and parents might not appreciate this Demand so no one bothered to tell us. Enter the community organizers like ACORN or its successor Action Now out of Chicago with much of the same personnel. More importantly though because I think Texans feel protected by their non-participation in Common Core, forgetting Texas adopted OBE statewide in the late 1980s when it was called a radical change, is the role of Saul Alinsky’s Industrial Areas Foundation, using schools and churches to community organize in that state. Do very many Texans understand that? How about people in Cobb County, Georgia where your new Super who came from Dallas ISD would have undergone a great deal of interaction and training around IAF goals and prescriptions? Or the new Super, Mike Myers, who retains a side business seeking federal School Turnaround grants. Is it a valuable asset in seeking those grants to be experienced in dealing with demands of community organizers specializing in urban schools? Makes sense to me that it would. But those are our tax dollars or debt that fund School Turnarounds based on these same Bad Urban Ideas. My goodness that sounds a lot like a focus on Relationships instead of content. Just the sort of urban school Quality Learning that Common Core now mandates nationwide. Suburbs too. The community organizers were probably quite pleased those long sought performance assessments were funded from the beginning in the 2009 Stimulus Act. Well, we know all that funding did not stimulate the US economy. Made a lot of educators, professors, and community organizers happy though. No wonder Van Jones says he signed on to the Environmental Green Movement because of the government’s ability to direct money where it wants as so much of the Green Economy is politically directed. As a funding taxpayer, that hardly seems Sustainable. Or Wise. What if Higher Order Thinking=Deliberate Confusion? Raise your hand if you were surprised by that definition of rigor in the previous post. No the challenge does not come from applying previously taught content in difficult ways. And higher order thinking is not synonymous with deep understanding in the fact-based, solid rational analysis, way we traditionally associate with school or university sanctioned understanding. The “deep understanding” being pursued by Common Core’s developers lives “beyond the realm of control and rationality.” It is based in psychological research of “how learners can be moved by things beyond their own intentions and goals.” I think this is a very troubling area for a government or an untaxed “charitable” foundation to be pushing and financing on behalf of citizens and future voters. But then I created the metaphor Invisible Serfs Collar for a multitude of reasons just like this. ASCD, which used to be the NEA’s curriculum development arm, has an entire approach centered around making Common Core applicable to the Whole Child. If you have not yet had a principal or other administrator use the term “holistic” to describe what makes the Common Core initiative so different you will (or would have before I wrote this post). If you have missed the ‘Must be Engaging to the Child” aspect to Common Core, you probably should have a quiet little chat with your child’s teacher about how she will be evaluated as an Effective Teacher to keep her job. And you thought that was what education was supposed to be all about? Moving beyond the caveman approach to interacting with his environment? I am afraid you, dear reader, would never make it through many of these education or sociology or psychology programs credentialing today’s educators, especially at the administrator levels. 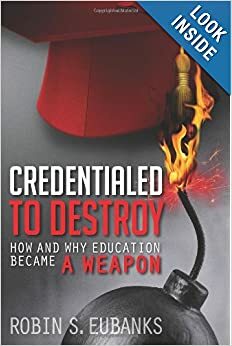 It can be hard to read this stuff and not wonder if ignorance or greed or a genuine desire for social revolution is the driving force behind these profs and some of the principals, supers, and other administrators they are now credentialing. Whatever guides them, they have our money, our children, and a completely reenvisioned future economy in their hands. At least for the moment. Higher order thinking and rigor in education in 2012 are trying to access that beyond reason realm of human consciousness. Actually so is the current emphasis on creativity and critical thinking. That’s why the pushed “problems, uncertainties, questions, or dilemmas” must be “unfamiliar” or “novel.” They are designed to “elicit answers that have not been learned already.” These are the “life skills” that misleading district or school charter authorizes. The teachers will be encouraged to teach strategies for coping with this type of open-ended problem solving, but not provide either answers or the kind of factual information from history or great literature that allowed earlier generations to successfully plot around life’s uncertainties. We may know that history repeats itself in terms of the broad themes that drive human action. The Outcomes Based Education/ Common Core generation apparently is to get to revisit everything anew without much knowledge from the past for guidance. Hard to imagine how this can possibly work out well. I think we have finally come up with a working definition of radical education reform of the type sought in the 90s and being implemented now in the US as the Common Core. It is targeting the non-genetic means of influencing the future and modifying, rejecting, or “improving” them. I think the Ancient Greeks called this kind of undisclosed world altering aspiration: hubris. And it never went well. That precise phrase first came up when I watched a tape from October 2011 of a National Network for Educational Renewal Conference explaining how “this time” we would finally get meaningful educational reform with the prevailing US culture and the whole child to be the focus of the school and curriculum. John Goodlad was quite passionate on the subject of the Good Society and its necessary conditions finally being in reach. I have written about Outcomes Based Education before and how its real focus is to change the child http://www.invisibleserfscollar.com/if-standardsoutcomesobjectives-what-is-the-real-common-core/. I stand by that today and would now like to point out that Professor John Goodlad was Ralph Tyler’s student and close friend and colleague. So there are numerous direct connections between that 8 Year Study and desired ed reform today. To really get a handle on what OBE looks like in a classroom and the kinds of explicit intentions I read all the time as I plow through official documents, let’s go Down Under to Australia which actually implemented the education reforms designed in the US and for the US in the 1990s. That’s what makes it a perfect place to see what full implementation of Transformational OBE looks like and what the actual aspirations for culturally transformative change look like. Take a deep breath or pour yourself a drink, whatever has a calming influence. Here goes. Open there does seem to be a synonym for persuadable. Malleable. Ready for transformational, doesn’t it? Now the Rigor in our 3 R’s actually tracks back to the definition for Higher Order Thinking. Both Rigor and Higher Order are synonyms for deliberately confronting students with unfamiliar problems, uncertainties, questions, or dilemmas that have no fixed or linear solution. Relevant means not abstract. Tied to real world problems in need of solutions. It allows an emotional response instead of a fact based analysis to be a perfectly valid student perspective. Relevance can also be satisfied by a vocational emphasis such as career pathways for all. A service learning mandate that gets students working in the community to try to solve real problems that they can then reflect upon at school is also a commonly cited means of obtaining relevant and authentic learning. That gets us to relationships which brings in the Caring Economics of the previous post. That professor and Australian Student Wellbeing advisor, Nel Noddings, who wants to use school to instill competences of care in each student, wrote the Prologue for Riane Eisler’s 2000 book Tomorrow’s Children: A Blueprint for Partnership Education in the 21st Century. Partnership education seeks a radically new integrated approach to learning that changes student values and their filtering mindset for encountering experiences in the future. Eisler’s point is to live on our Mother Earth in less destructive, more peaceful, equitable, and sustainable ways. It is a hard book for me to read because I think her recommendations will gut everything that does work now Even if it is not perfect. I think Eisler is guided less by reality than the utopian future she wants to use education to try to create. But factually wrong does not mean a book or concept is not still influential. And most of her readers will not have a working knowledge of history, economics, and political theory to rebut the assertions. She’s not kidding either. She wants to transform “the psychological and social dynamics of relations in all spheres of life.” No wonder we see so much focus on social and emotional learning and affirmative measures to redefine School Climate. And Purple America. Common Core then is not about content to be taught. It is about the kind of values and attitudes and beliefs a person will need for this reimagined society. If this is a false, potentially tragic pathway, and I think it is, we really are careening towards an abyss if we blindly keep implementing Common Core as it is actually configured for schools and classrooms near you. This fall. 2012. If Standards=Outcomes=Objectives, What is the Real Common Core? Have you ever thought about the fact the schools are the one social institution that almost everyone of our future voters and workers passes through? Usually for years at a time. Well you should for a minute because every person who aspires to major social or political or economic change has known it and relied on it. And said so repeatedly. And if the designers of what became a controversial policy or practice were open enough initially to tell us why, we should listen. Tomorrow we will focus on why. Today we will focus on the what. The fundamentals of the proposed changes to the schools and why we get name changes from decade to decade, but no real change in the purpose or function of the education establishment’s idea of reform. To understand Common Core’s reality and not just the sound bytes of its sales/PR campaign, we have to go back to the 1930s and something called the 8 Year Study. OK– I heard that skeptical reader out there who is quite sure I must be stretching it to go for a damning comparison. I am using a copy of the report that was republished and updated by Maine educators in April 2000. Does that sound stale? It looks to me like it was getting ready for implementation under the last round of federal education reform-Goals 2000. You want more up to date? Something that ties directly to our current version of Common Core and how it is really going to be implemented? Would the Fall 2009 AERA Curriculum Studies Newsletter do? Still the template. Still relevant. Right now. My favorite part is recognizing that what the 8 Year Study and our version of Common Core are actually rejecting is what we are being led to believe we are getting. Does this sound familiar? So in the name of national consistent content standards out goes school as an intellectual process. Prescribed subject matter. Also known as Content and Knowledge. The best that has been thought and said by the best minds over the centuries. The cultural foundation of the world we have and the worlds that ended tragically. All gone. But we at least get a newfound emphasis on the physical and emotional. That’s convenient isn’t it? What a useful way to make learning accessible to all. Except learning has a new meaning. It now means changing beliefs, feelings, values, and behaviors. No they didn’t give us a Glossary of what these terms actually are now to mean. I guess that’s what I am here for. And the new concept of learning from the 8 Year Study? Coming to a school and classroom near you soon via Common Core and NCLB state waivers and Race to the Top grants and the current avalanche of publicity over bullying and a few other methods we will be talking about this summer? Those are my snarks in parentheses. Ralph Tyler came up with the obscuring term Objectives in the 1930s as well as “assessment” to try to hide just how very little graduates of such schools would actually know. Outcomes replaced it in the 80s and 90s. Parents and taxpayers of course wanted good outcomes and solid academic results. Nobody told them the entire nature of the education game and purpose had been transformed. All that money wasted because no one would tell the public what was really going on. The inevitably poor academic results, since that was no longer the actual purpose or goal in the schools and districts adopting this vision, created the need for a name change. Standards, high would be nice for a change, replaced outcomes with no change in actual goals or focus. If you listen carefully to the advocates of Common Core you will hear them frequently use outcomes, objectives, and standards interchangeably. Sometimes skills and competencies as well. The things a student is to believe. How each student should feel. What each student should value. How each student is to behave as a matter of habit. That’s the Common Core. And tomorrow I will tell you why using the designers actual quotes. From a 21st Century source.